In order to better understand what ∞OS is about we invite you to one of our regular physical training sessions – in Berlin, Paris or Moscow. You can join at any level of proficiency and we will demonstrate the basic concepts, principles and procedures of ∞OS, which you then can test out in group exercises there and then. The training usually takes from 2 to 3 hours and is free of charge, open to everyone to join at any time. Check out the schedule in the Trainings section of this website or in ∞OS Facebook group. You can also see our previous classes to have a better idea of what we normally do and watch some videos in the description below. ∞OS Initiation Session is a short session based on interactive physical exercises that will inform you about all the basic principles of ∞OS and show you how you can apply them in practice, in work, and in everyday life. We use a combination of different approaches derived from a wide spectrum of fields ranging from physical practices to organizational frameworks. 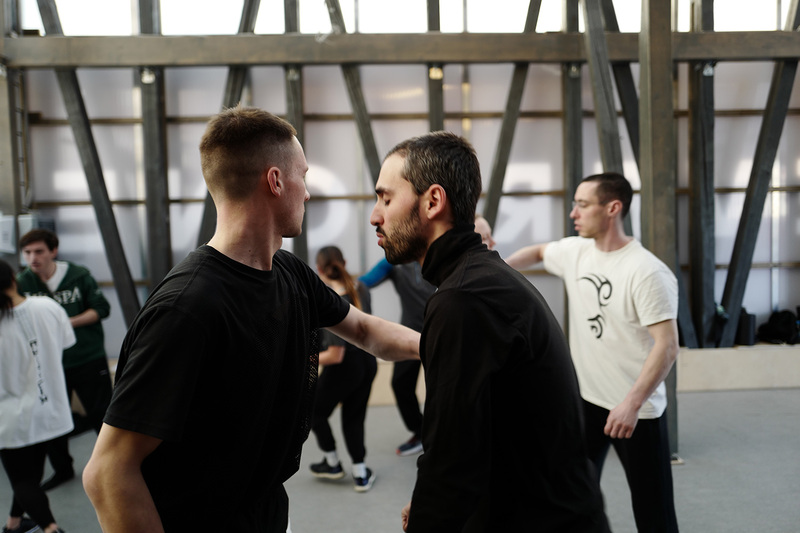 For example, we combine Systema martial art and Version Control practice from computer programming; Noguchi Taiso movement technique and Agile approach organizational framework; contemporary dance and network theory; improvisational theater and dynamical systems theory. We focus on exercises that bring relaxation, efficiency, and unobstructed flow into one’s psyche and into the group dynamics. After the session you will have a great uplifting feeling in your body, you will have tried something new, and you will experience a different way of learning, which combines physical practice and intellectual approach to come up with new patterns of behavior and to hack the implicit systems of operations that are in place. • Becoming more adaptive and relaxed in stressful situations, learning to turn them to your advantage. • The implementation of highly effective and efficient operating principles which strengthen and improve group dynamics and flow. • Learning how to adapt to the shifting external pressures and transform them into opportunities while staying aware, creative and functioning within a group. • Within a few hours, you’ll get a thorough and holistic introduction to ∞OS. This fast-paced and concise session is delivered in a single session providing participants a cost-contribution and accessible first step. • Feel much more relaxed, invigorated and connected both to their own bodies and to the people around.